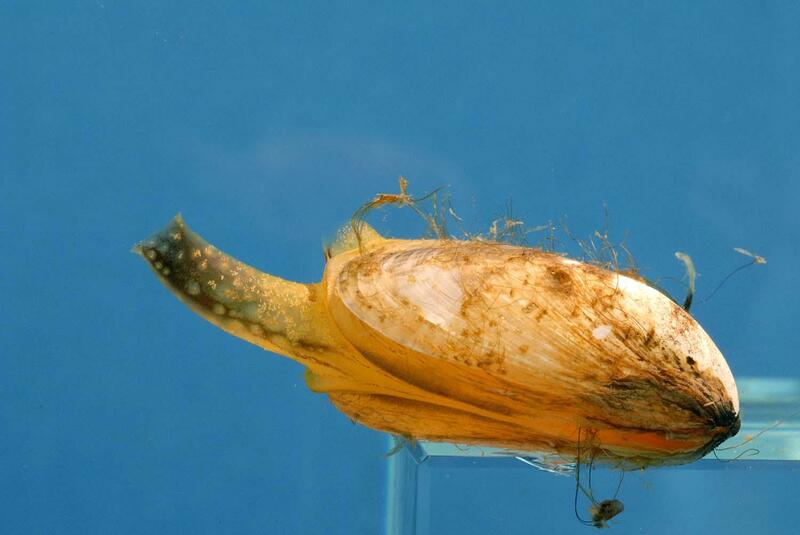 Quagga mussels are considered the "STD of the Sea" according to a public service awareness campaign from the Utah Division of Wildlife Resources. When the Utah Division of Wildlife Resources encouraged people this summer to “practice safe boating” they weren’t talking about wearing your life vest. They meant taking steps to avoid getting an STD: a "Skiff-Transmitted Disease." The STD implicated in this campaign is actually a family of freshwater mussels -- zebra and quagga mussels -- that have found their way into Utah’s lakes, where they reproduce rapidly and cause a lot of problems. "They had their biologist come and meet with us and give us a lot of history on the issue. They let us know that these invasive mussels destroy fisheries, pollute shorelines, damage boats and ultimately cost the state millions of dollars to control," said Christina Davis, an account manager at Penna Powers, an advertising firm in Salt Lake City. The Utah Division of Wildlife Resources asked her for help communicating the problem of invasive mussels in Utah. Kenny Hammond is a senior art director at Penna Powers. In what may have been the most hilarious, irreverent and pun-filled creative meeting for a DWR public service announcement, Hammond and his team came up with the “STD of the Sea” campaign, comparing invasive quagga and zebra mussels to sexually transmitted diseases passed from lake to lake by careless boaters who don’t use proper protection. Davis added that the DWR let them know that they have been educating boaters for years about the invasive mussel problem but felt like people had started to become deaf to the messages. There’s an intimacy to water that’s part of what works about the campaign, cheeky as it may be, which Hammond said they were trying to convey in the "STD of the Sea" campaign: "If you love these bodies of water and you love boating, then you should take care to clean your boat." It’s extremely difficult to clean up an infected body of water once it’s been infected by these mussels, so the Division of Wildlife Resources is focused on preventing their spread to uninfected lakes. The message is pretty simple: clean all the mud and lake gunk off your boat when you pull it out of water, drain everything that can be holding water on your boat like ballast tanks and bilges, and then let your boat completely dry out before putting it back in the water. Right now the infestation is limited to Lake Powell in Utah and hopefully the STD of the Sea campaign can scare boaters into keeping the rest of the state clean. Quagga mussels. They're calling them a skiff-transmitted disease. They start as a microscopic organism on boats, and then stage a hostile takeover of the environment. Division of Wildlife Resources' Sarah Seegert says the invasive species is dangerous to waterways and society. State officials in Utah continue efforts to try to stop the spread of the quagga mussel, which is about the size of a human fingernail, but presents a serious threat to the state's water supply and fisheries. Matt Bartley is a biologist with the Utah Division of Wildlife Resources. He said the state is inspecting boats near Lake Powell, which is infested with the mussels, to try to prevent them from spreading from the boats to other bodies of water. He said the tiny organisms can plug up major water infrastructure. "The mussels are really efficient at reproducing and attaching to hard surfaces," Bartley said. "And those hard surfaces would be the water infrastructure; so the dams, the water pipes, the docks - anything that's hard and in the water."